Ambassador David Friedman meets Israeli and US firefighters who are fighting arson fires in the south. U.S. 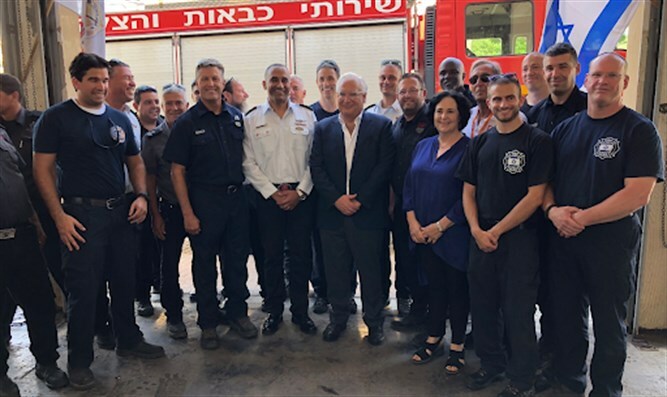 Ambassador to Israel, David Friedman, visited Sderot's fire station this morning. He met with firefighters who are working to extinguish the fires on the border along the Gaza Strip, including 10 American firefighters. The American firefighters, who volunteer through the Emergency Volunteers Project (EVP) organization came to Israel from the U.S to help their Israeli counterparts fight fires caused by incendiary kites and balloons launched from Gaza towards Israel. Israel’s Fire and Rescue Commissioner Dedi Simhi also came to thank the firefighters.